China has started construction on its section of the Power of Siberia gas pipeline, Gazprom said in a press release. China has started construction on its section of the Power of Siberia gas pipeline, Gazprom said in a press release. Work on the Russian section of the pipeline is on schedule, the company said. “It has been noted that the construction of the pipeline to receive gas from Russia was officially launched in China last week, while the welding of the first joint is scheduled for the end of June,” Gazprom said in the press note. 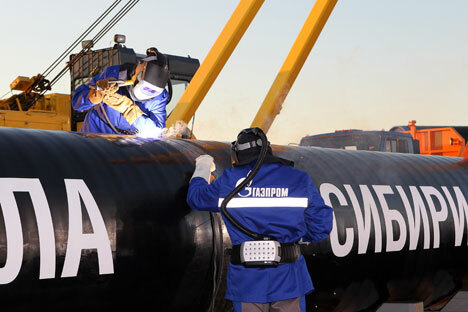 In late May, Gazprom reported that it expects to build between 43 and 50 km of the Power of Siberia gas pipeline in 2015, while China's CNPC could begin to build a portion of the pipeline on its territory as early as in June. Gazprom's chairman of the board Alexei Miller met the State Council of China's First Deputy Premier Zhang Gao and CNPC's chairman of the board Wand Yilin in Beijing on June 2. The parties discussed the progress of negotiations on gas supplies to China via the western route and the schedule of further preparations for the signing of the contract. In November 2014, Gazprom and CNPC signed a framework agreement on the supply of gas via the western route. At the initial stage, gas supplies to China in this area may be 30 billion cubic meters per year. In May 2014, Gazprom and CNPC signed a 30-year contract to supply natural gas to China along the eastern route via the Power of Siberia gas pipeline. First published in Russian by Vedomosti.